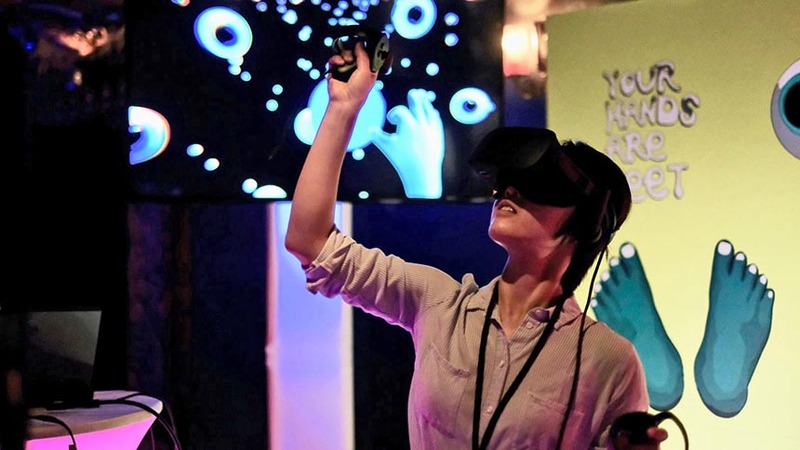 Earlier this year the tech blog Engadget announced that they were giving away half a million dollars in $100,000 chunks to five media arts pieces exploring the technologies of Virtual Reality, Augmented Reality, and Mixed Reality. 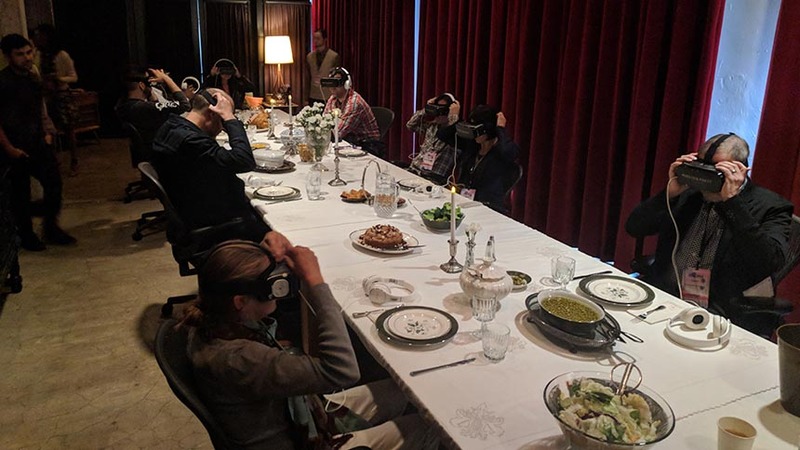 Half a year later and those five pieces debuted this week (whether totally finished or not) at The Engadget Experience Alternate Realities event in downtown L.A. We were on hand to try out each of the pieces and report back on what's going on in what's collective being called, XR. The most narrative piece of the five is Angel Manuel Soto's 360 VR story about one of the most famous alien abduction tales. Set in 1961, Dinner Party takes us into the lives of Barney and Betty Hill, an interracial couple in New England. The scene is set as an omnipresent 360 camera floats through the pre-dinner party cocktails, directing the viewer's (or for the sake of VR parlance, "visitor's") attention in a way uncommon in VR -- but also particularly effective. The spatial audio plays a key component as the visitor listens in on multiple conversations which are then interrupted by Betty Hill's pronouncement that she has an audio recording she needs to play for the group, much to her husband's dismay. The true story of the Hills revolved around revelations each spouse made under hypnosis regarding an alien abduction. These tapes of the hypnosis sessions served as the basis for the couple's claim and here the tape also serves to transport the visitor into a reenactment of the events. 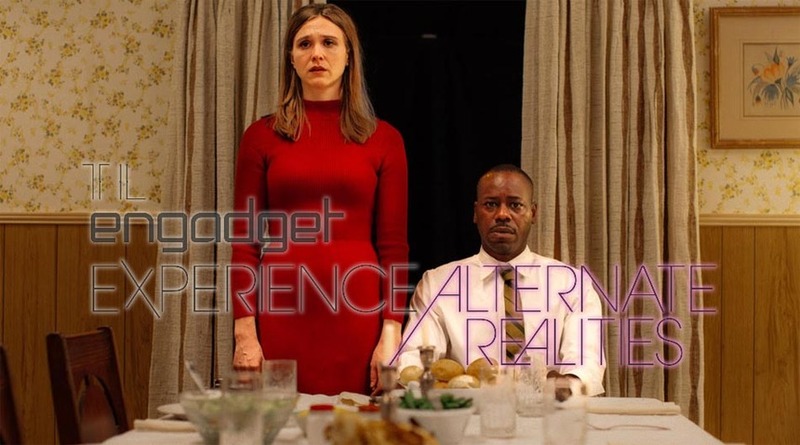 While the version of The Dinner Party on show at Alternate Realities is very much a work-in-progress, we do get to experience the first pieces of the abduction and it points to awesome things coming when the piece is complete. Soto's work on the highly stylized docu 360 VR piece Bashir's Dream has informed his storytelling in VR greatly and shows tons of promise. 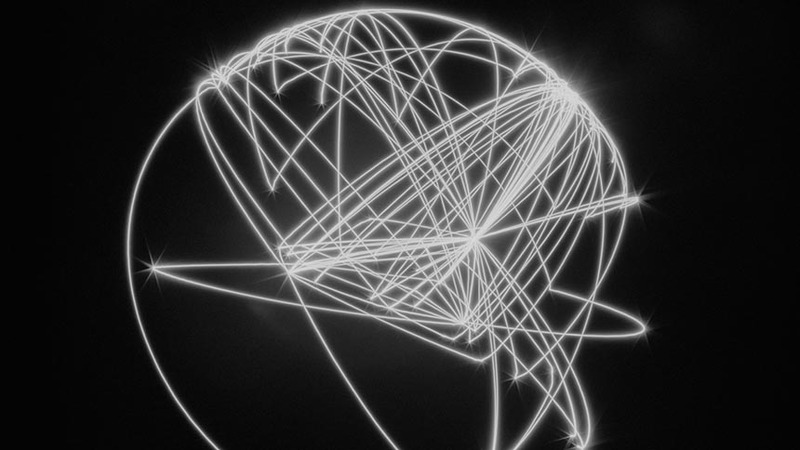 Perhaps best described as an interactive multimedia VR infographic, Mapper's Delight taps into the data collected by Tahir Hemphill's Rap Research Lab culling countless hip hop tracks for geographical mentions in lyrics and plotting them (plus samples from the tracks) onto an interactive 3D globe. Along with David A.M. Goldberg and Nick Fox-Greig, Hemphill has created a project that allows the visitor to activate these music samples into a symphony (or perhaps cacophony) while viewing the cultural impact of certain locales on the evolution of hip hop. For instance, by circling your hands over the data-dense New York region and over slightly less-so Los Angeles, you can create your own East Coast-West Coast aural VR beef. The idea of presence and self-recognition are hot topics in the VR world. If a 5-foot woman suddenly finds herself in a 6-foot man's body in VR, does her brain have trouble identifying with that self? While this is not exactly the issue tackled in Glenn Kaino's and Jesse William's Untrained Eyes, it is certainly getting at the same themes. In their piece, best described as an A.I. art installation (AIAI? 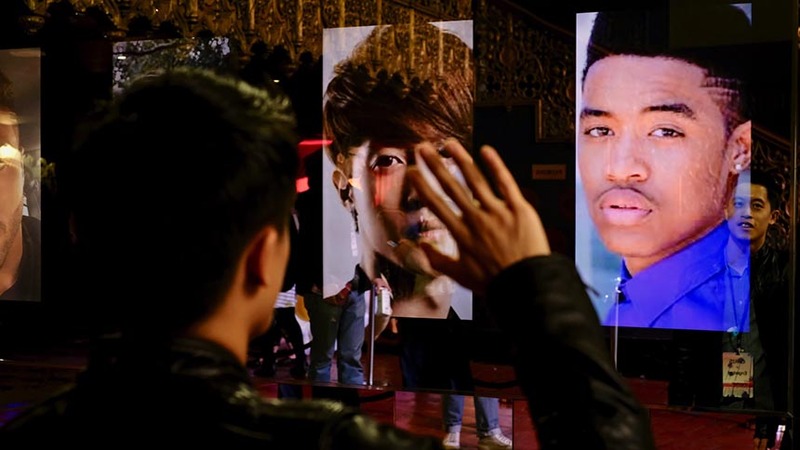 ), Kaino and Williams have created a long piece of mirrored glass with 5 portrait-oriented displays behind it. When a visitor steps to the mirror and waves, the motion sensors scan the person's face and reference an enormous database of faces for similar characteristics. By design, the face that is projected back is only an approximation of the visitor. But the dissimilarities between you and your reflection create an immediate emotional reaction that needs to be experienced to be fully understood. Kaino explained that one goal of the piece is to explore the way these failures of representation have increasing impacts when applied to large datasets. This is best evidenced when searching for basic terms such as "men" on Google Image Search. 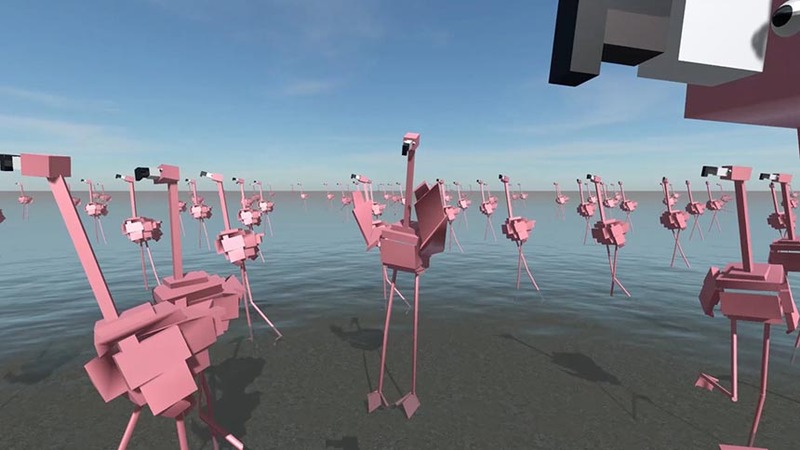 Shining a light on a mounting environmental challenge via Augmented Reality, Kristin Lucas's Dance With FlARmingos shoves the visitor into a cartoon Flamingo mating ritual and asks them to join in. Created with New York's Pioneer Works along with other collaborators, Lucas created the piece as a way to make the experience of helping to save the endangered species more real. Visitors begin by opening up their senses to the smells of the wetlands habitats of the endangered birds. They then move to an AR viewing station where they can hold up tablets to see the animated birds interacting with the visitors in the virtual mating area. By clicking on the birds, visitors can learn about birds that have already been adopted, their area of migration, and years of birth. Finally, the visitor dons a Microsoft Hololens headset and enters into the mating ritual themselves. Visitors can also plunk down a few dollars to adopt one of the birds in real life (and we can assume in virtual life, too). The final piece by Amelia Winger-Bearskin and Sarah Rothberg is all about disorientation. Visitors in this room-scale VR experience on the Vive find themselves in a stylized cartoon world where a carton of eggs holds the key to a few different disorienting experiences. What does it feel like to have feet for hands? How weird is it to shave a giant's legs? What would it be like to find yourself surrounded by dozens of musical eyeballs? Those questions can finally be answered in Your Hands Are Feet. It's also good to learn that it's extremely fun to play the drums while floating in a sea of cartoon eyeballs.